Abstract: The RP Fiber Power software it has been extended such that stimulated Raman scattering can now be included in simulations with numerical beam propagation. The implementation is highly flexible, allowing for arbitrary transverse profiles of nonlinear coefficients and interactions between a substantial number of waves with different wavelengths. Recently, researchers using our RP Fiber Power software told me that they were missing the possibility to include stimulated Raman scattering in simulations based on numerical beam propagation. Interactions via laser gain and cross-phase modulation had already been implemented, but not yet SRS. I was originally somewhat skeptical against the idea to implement this, but came to the conclusion that it might actually be useful for many. An original concern was that substantial Raman conversion often requires many meters of fiber, while for numerical beam propagation will usually require numerical step sizes of a few microns only. That combination results in a huge number of numerical steps and correspondingly long computation times. However, first of all some researchers are quite prepared to let the software run even for several hours, if this produces some essential results. Second, in the context of nanosecond pulses we can have substantial peak powers, resulting in strong Raman conversion even within quite limited lengths of fibers – possibly even far below one meter. On the other hand, there are cases where it absolutely makes sense to use numerical beam propagation, taking into account the full transverse dependencies not only of the optical fields, but also of the fiber structure – considering the refractive index, nonlinear index and Raman gain coefficient. (Note that the refractive index profile of silica fibers is often shaped by the germania doping profile, which also happens to affect the nonlinear index and the Raman gain coefficient.) One can easily imagine cases where simplified simulations, ignoring transverse profiles, cannot provide the required answers. Clearly, one wants to allow for arbitrary transverse dependencies not only of the refractive index, but also of the nonlinear index and the Raman gain coefficient. For the latter, I provided the new function bp&lowbar;set&lowbar;SRS(); with that, the user can assign a mathematical expression to the current beam propagation device. The software automatically checks whether that depends on the radial coordinate r or alternatively on x or y. For single-mode fibers, that trick should work fine. Only, numerical beam propagation may then not be the ideal technical approach, since simple power propagation should be sufficient (and much faster) in cases where the transverse beam profiles can be considered to stay constant. 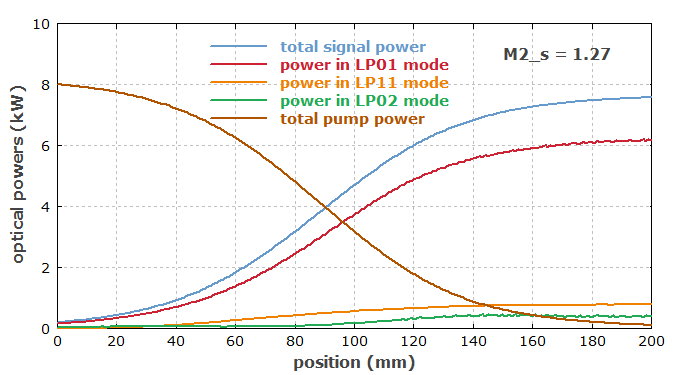 In multimode fibers, the intensity profiles of pump and signal waves can change on a rather small length scales because of the substantial differences in propagation constants of modes. That seems to suggest that the Raman conversion should be simulated with rather fine numerical steps – with a step size well below the mode beat length. However, errors resulting from larger step sizes may actually more or less average out after many numerical steps. Therefore, it is not generally true that larger step sizes make no sense. In that situation, software should again be as flexible as possible. By default, RP Fiber Power will use the same fine steps for Raman conversion as it uses for the other effects. That can be changed with the function bp&lowbar;set&lowbar;SRS&lowbar;steps(N), with which the user can indicate that the Raman conversion should be simulated only every N numerical steps. Users can then try themselves whether they can save some computation time without too much compromising the accuracy of results. Figure 1: Evolution of optical powers in the fiber. Although numerical beam propagation is of course not based on the concept of fiber modes, powers in a couple of signal modes have been calculated using overlap integrals. Some people study cascaded Raman conversion processes, where a first Stokes wave pumps a second Stokes wave etc. There are cases with one or several pump waves amplifying several signal waves, having different wavelengths. If the signal waves substantially differ in wavelength, there can also be a Raman interaction between those. Therefore, I expect that interesting further scientific research will be enabled by this software extension. As usual, we offer a free update to all customers having RP Fiber Power at least in version V5. (That is the version where numerical beam propagation was introduced.) Notably, such a generous practice is usual for RP Photonics, but not necessarily for other software suppliers. Quite often, they will try to make you pay for every new feature introduced. We do that only if we bring out a major new version, and even in such cases the upgrade (as we then call it) costs only little more than the difference in license prices. You can have the free updates without regularly paying for a maintenance subscription or so.